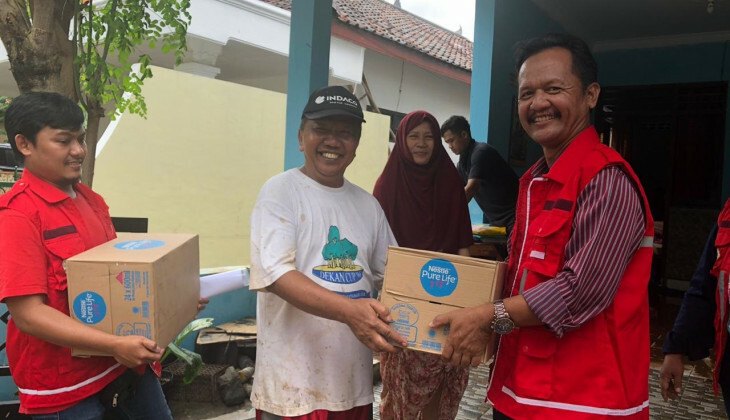 A team from DERU (Disaster Response Unit) UGM did a social work on Monday (18/3) for the communities impacted by the flood that hit a number of areas in Yogyakarta, particularly Wukirsari and Girirejo villages in Imogiri, Bantul regency. Head of Community Empowerment Sub-directorate UGM, Nanung Agus Fitriyanto, Ph.D., said many houses in Wukirsari and Girirejo were flooded by the runoffs of the Celeng and Sili rivers. “The rains that occurred since Saturday had caused the runoffs of rivers in this area,” said Nanung. The DERU UGM team, said Nanung, distributed aid such as food, mineral water, and other basic necessities to the impacted people. Nanung added that the water had started to recede in Sili and Celeng rivers. Currently, the people and volunteers are cleaning up the impacted areas. Following the disaster, Yogyakarta mitigation agency(BPBD DIY) and other regional disaster agencies have done mitigation efforts. Head of BPBD DIY, Biwara Yuswantana, said as many as 5,046 people were impacted by the floods. On mitigation, he said as many as 23 evacuation spots had been set up to accommodate the people. But some of them have returned home.